Everyday we pursue another originality for the future. 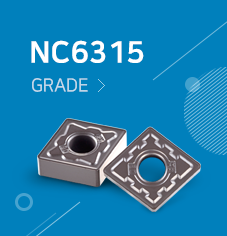 Korloy's new grades are designed with optimal substrates for each application and are PVD coated for high temperature, high hardness and oxidation resistance, or CVD coated for high tempeure and wear resistance. Korloy turning tools cover a wide application range with a full line-up of ISO tools and FGT tools that produce high quality and hight precision parts for all manufacturers requirements. Korloy multi-functional tool can machine grooving, part-off, facing and forming in various applications. It design ensures superior machinability and productivity. Korloy threading tools are available for machining of various shapes of thread at various pitches with high quality. Milling tools that provide the best quality for customer's needs and improve productivity. New technology and technical know-how, the best qualified for increasing productivity and machinablilty. provides total solutions in hole making based on development, research and tooling know-how. The guide to Korloy's carbide cutting tools.